Earlier this year, Super7 announced plans to make classic Universal Monsters retro-style Halloween buckets and even showed off the pre-production samples at the New York Toy Fair. The company has just announced that they will have the Frankenstein and Creature from the Black Lagoon buckets for sale at this year's New York Comic-Con from October 4th through the 7th with each bucket costing a mere $20. In the original announcement, there were Wolfman and The Mummy buckets, but Super7 will only have the Frankenstein and Creature from the Black Lagoon buckets for sale at this time. 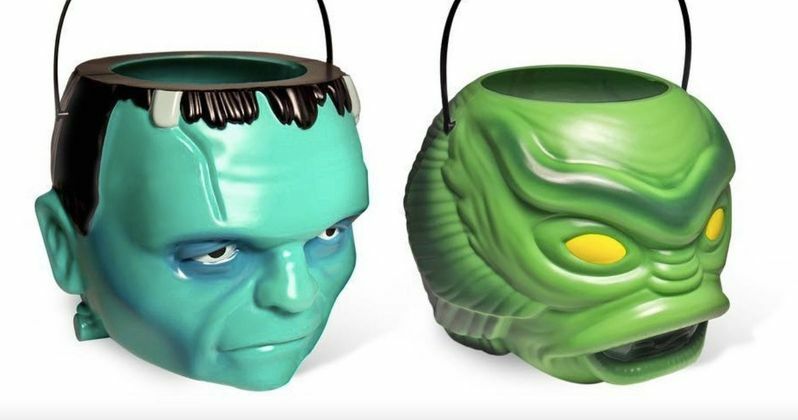 Both of Super7's 1980s-style Halloween buckets look awesome, but the Creature from the Black Lagoon has a slight edge over Frankenstein's Monster, whichever you prefer. However, The Wolf Man bucket looks the best out of all four when it made its debut through the pre-production samples. It's unclear if Super7 has completely ditched the Wolfman and Mummy buckets, or if they'll be available at a later date, possibly with a Dracula bucket. Dracula is sadly missing from the Halloween bucket line and he would make for a worthy addition to the collection. The Universal Monsters have been back in a big way this year, showing up at Halloween Horror Nights and having their own Saucony limited edition shoes at this year's San Diego Comic Con. Super7 even has classic figures as well as puzzles that they've created for 2018 that will also be for sale. They've also created 55" retro Paper People Halloween decorations for Frankenstein and Wolfman that will exclusively be available at New York Comic-Con for $25 each. The Paper People would fit in at any Halloween party, or they can just be up all year round. In addition to the cool retro Halloween buckets and other Universal Monsters gear, Super7 will also have the limited edition versions of their third wave of Alien ReAction Figures on blue cards. Ripley (with Jonesy), Parker, Lambert, Kane (with Facehugger), Bretty, and Alien will be available as a set for $90. The Great Garloo - Original ReAction Figure will be available as well for $15 each and the same goes for Phantom Starkiller - Super7 x Killer Bootlegs Collaboration ReAction Figure, which looks pretty awesome. Super7 isn't the only toy game in town for this year's New York Comic-Con. Funko is back with some pretty awesome exclusive figures from beloved TV shows The Brady Bunch and Married with Children. Jan Brady gets her own Pop! figure for this NYCC exclusive, which also contains her fictional boyfriend George Glass. While the Bundys have their own Pop! figures hitting store shelves soon, they have New York Comic-Con exclusive action figures from the popular vinyl toy company. It might be a good investment to stop by Super7's booth first to purchase the classic Universal Monsters Halloween buckets so that you carry your other purchases in them. You can check out the Halloween buckets below, thanks to Super7.